I spotted this sign hanging from this historic plant in a Kew Garden greenhouse the first time I was in London. I then had to find it again on my second trip, both to show B and to get a photo of it. 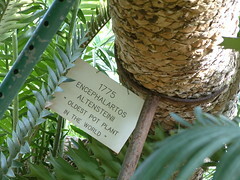 The language joke is a bit juvenile, but come on, that plant is older than our country! 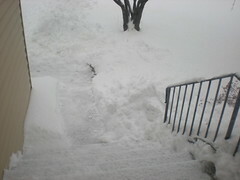 Here's our front walkway, shoveled this morning by B. The snow was coming down in huge flakes today, but I was grateful the temperatures were much higher than earlier this week. Merry Christmas to everyone, if you are so inclined. 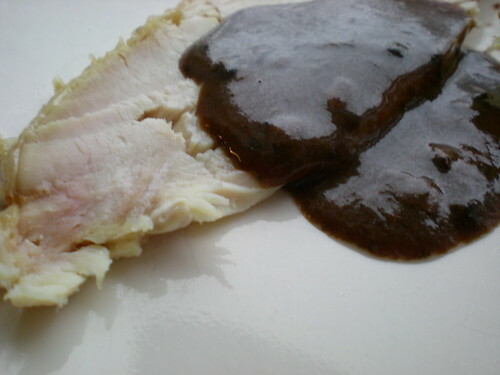 Here's how I made the gravy for Thanksgiving this year. 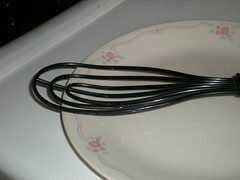 3) Using a flat whisk, I deglazed all the stuff from the bottom of the pan (wasn't much - the turkey retained most of its fat and juices) and stirred until it had mostly melted. B then helped pour everything out of the roasting pan into a medium size sauce pot. 4) The sauce pot went on another burner, also on medium. I had two measuring cups nearby: one had two Tbsp of flour dissolved into half a cup of water, the other was just a cup of water. Nowhere near all of either of these went into the gravy. Stirring constantly, after the solids had almost all dissolved (I got impatient) I started by drizzling a bit of the flour mixture into the pot. Since it was near boiling, this thickened the mixture immediately. I kept alternating between the water to add volume and the flour mixture to thicken until it "seemed like enough". You don't need much. 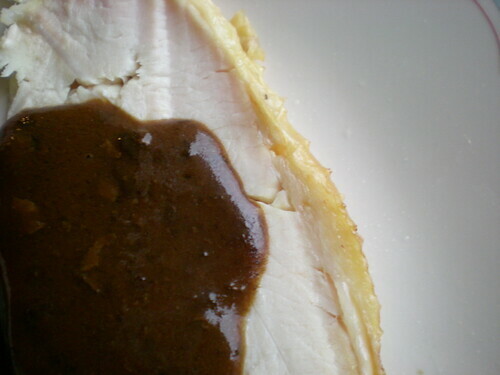 And the turkey doesn't need it for moisture because Alton's method turns out so well. 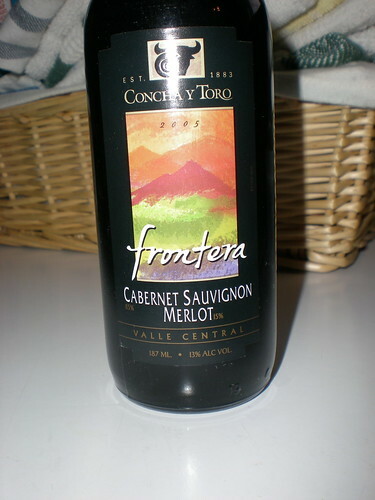 OF COURSE THIS IS GOOD GRAVY - IT IS MOSTLY WINE AND FOND. I lost my voice last night because of the cold I've been fighting this week. I CAN talk normally, if I don't mind coughing up a tonsil after each sentence. Today at work I managed to communicate verbally by whispering. 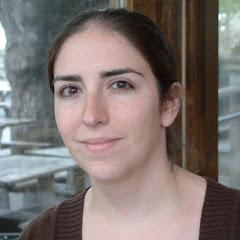 It worked fairly well over the phone, because I could be very quiet and the other person heard me just fine. Face-to-face was interesting because everyone tended to whisper back as a trained reaction when someone whispers to them. But, my ears are also clogged from the cold, so I couldn't understand what they were saying. So, I had to let each individual I talked to know that they needed to talk back to me at a normal volume. (Apparently this is difficult.) I got a lot more funny looks than normal today. I don't have any mobile devices that can see the Internet. My phone is so old you can't even send it photos. (Well, you can try and send me a wad of data, which it will not display.) BUT, I am loving the "mobile" versions of websites. Several sites that I try to use regularly take up so much bandwidth (*cough* my bank *cough*) or have slightly broken widgets (*cough* Weight Watchers *cough*) that I can't get reliable operation out of them. Ah, but the Mobile versions are OPTIMIZED for tiny bandwidth and "just the basics" functionality. So, say it is lunch time at work so the network may as well be dial-up: in this case I can still check transactions at the bank or enter my meal into the online WW planner. Since I'm using a regular browser, this only works for sites that let you "force" mobile, rather than asking the browser if I am really an iPhone before giving me the goods. If you want to try this out, usually the link to the mobile version of a site is on the main page. And, of course, there's always Google if the Flash-based broken-Java ad-strewn regular website is *gasp* hiding information.